For the Game Boy Advance remake, see River City Ransom EX. River City Ransom (ダウンタウン熱血物語, Downtown Nekketsu Monogatari?, "Downtown Nekketsu Story", known as "Street Gangs" in Europe) is part of the long-running Kunio-kun series of beat 'em ups and sports games. Unlike other beat-'em-ups of the era it features a somewhat free-roam environment, reusable weapons, and a shopping system. The plot is simple: Slick (Yamada) has kidnapped Ryan's (Riki) girlfriend, and has recruited gangs from the local high school to take over the River City. Alex and Ryan must fight their way into the school to rescue her, and save the city from Slick's cronies. River City Ransom was ported to two systems. The Super CD port uses Redbook music and digital sound effects as well as improved graphics, while the X68000 version features an expanded game world. 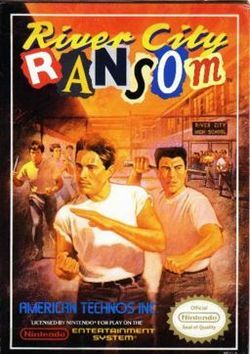 The game was later significantly redesigned by a different publisher, Atlus, for the Game Boy Advance and released as River City Ransom EX. This page was last edited on 21 October 2018, at 20:06. This page has been accessed 45,204 times.